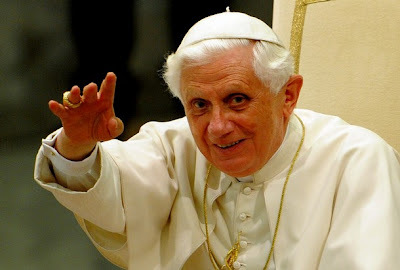 He might still be keeping house out at Castel Gandolfo, but the last two Wednesdays have seen B16 hop a chopper to the Vatican for the weekly General Audience. His recent catecheses focusing on the figure of Paul -- it is the Pauline Year, after all -- yesterday's talk reminded that the key to the apostle's journey remains anything but his alone. We can see that the two sources, the Acts of the Apostles and the Letters of St. Paul, converge in a fundamental point: The Risen One spoke with Paul, called him to the apostolate, made him a true apostle, a witness of the resurrection, with the specific charge to proclaim the Gospel to the pagans, to the Greco-Roman world. And, at the same time, Paul learned that, despite the immediateness of his relationship with the Risen One, he must enter the communion of the Church, be baptized, and live in harmony with the other apostles. Only in this communion with all will he be able to be a true apostle, as he wrote explicitly in the First Letter to the Corinthians: "Whether then it was I or they, so we preach and so you believed" (15:11). There is only one proclamation of the Risen One, because Christ is only one. As we see in these passages, Paul never interprets this moment as an event of conversion. Why? There are many theories, but the reason is very obvious. This change of his life, this transformation of his whole being was not the result of a psychological process, of a maturation or intellectual and moral evolution, but it came from outside: It was not the result of his thinking but of the encounter with Jesus Christ. In this sense it was not simply a conversion, a maturing of his "I," rather, it was death and resurrection for himself: a life of his died and a new one was born with the Risen Christ. In no other way can this renewal of Paul be explained. All psychological analyses cannot clarify or resolve the problem. Only the event, the intense encounter with Christ is the key to understand what happened: death and resurrection, renewal on the part of him who revealed himself and spoke with him. It is in this more profound sense that we can and must speak of conversion. This meeting was a real renewal that changed all his parameters. One can now say that what before was essential and fundamental for him, now has become "rubbish" for him; there is no longer "gain" but loss, because now only life in Christ is what counts. However, we must not think that Paul locked himself blindly in an event. In reality, the opposite occurred, because the risen Christ is the light of truth, the light of God himself. This enlarged his heart, and opened it to all. At that moment, he did not lose all that was good and true in his life, in his heritage, but understood in a new way the wisdom, truth, and depth of the law and the prophets; he appropriated them in a new way. At the same time, his reason opened to the wisdom of the pagans. Having opened himself to Christ with all his heart, he became able to engage in a wider dialogue with all, he made himself everything to all. Hence he could really be the apostle to the pagans. Let us now look at our situation. What does this mean for us? It means that also for us, Christianity is not a new philosophy or new morality. We are Christians only if we encounter Christ. Of course he does not show himself to us in that irresistible, luminous way, as he did with Paul to make him Apostle of the Gentiles. However, we can also encounter Christ in the reading of sacred Scripture, in prayer, in the liturgical life of the Church. We can touch Christ's heart and feel him touch ours. Only in this personal relationship with Christ, only in this encounter with the Risen One do we really become Christians. And in this way, our reason opens, the whole of Christ's wisdom opens and all the richness of the truth. Therefore, let us pray to the Lord to enlighten us, so that, in our world, he will grant us the encounter with his presence, and thus give us a lively faith, an open heart, and great charity for all, capable of renewing the world. Migration is a phenomenon that has been present from the dawn of human history, and it has always, for this reason, characterized the relations between peoples and nations. The emergency that migration has become in our times, nevertheless, calls out to us and, while it solicits our solidarity, demands, at the same time, effective political answers. I know that many regional, national, and international institutions are occupying themselves with the question of irregular migration: I applaud them and encourage them to continue this meritorious work with a sense of responsibility and humanitarian spirit. The countries of origin must also show a sense of responsibility not only because it is a matter of their own citizens, but also to remove the causes of irregular migration and cut off at the root all of the forms of criminality that are linked to these causes. For their part, European countries, and all other countries that are the destination of immigration, are called to, among other things, develop through consensus initiatives and structures that continue to adapt themselves to the needs of irregular migrants. The latter must be made aware, on the one hand, of the value of their own lives, which are a singular good, always precious, that should be safeguarded in the face of the grave risks that the pursuit of better situations exposes them to and, on the other hand, the duty of legality that is imposed on all. Like any father, I feel a profound obligation to recall everyone’s attention to this problem and to ask for the generous cooperation of individuals and institutions to deal with it and to find solutions. May the Lord accompany us and make our efforts fruitful! According to the wires, four of the would-be migrants were expectant mothers. One child also was lost. And, lastly -- keeping with his penchant for shirking the armchair -- on Monday the pontiff received Ingrid Betancourt, the Colombian politician whose six-year captivity by a rebel group in her homeland ended with a "miraculous" release in July, in a "very emotional" private audience. Recalling hearing Benedict's appeals for her release, the former senator and presidential candidate said that the 25-minute encounter was "a dream come true." Within days of her liberation, Betancourt headed to Lourdes, both to give thanks for her release and to pray for the almost 700 hostages who remain held by the Colombian leftist group FARC.